We Have BIG Plans to create an Outdoor Learning Environment! First Steps at Monarch Montessori of Denver applied and received a grant to improve our outdoor space through ECHO- Early Childcare Health Outdoors. We have begun the initial planning stage of our new Outdoor Learning Environment while considering the best utilization of our space to serve our students and our community. The idea is to create a space that students can learn and explore nature in a safe environment. These plans follow the Montessori approach of having children immerse and connect with nature to learn from and respect. 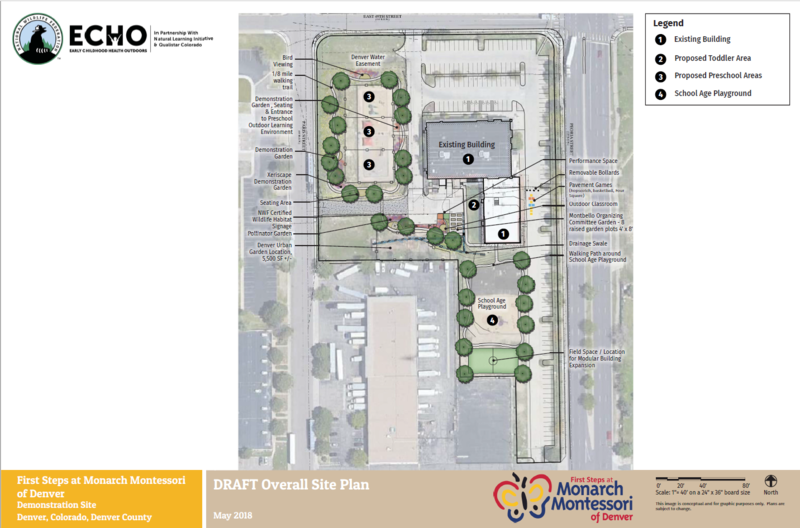 Monarch is fortunate to have space to include the Montbello community in their plans as a way to connect and give back to the surrounding community. This initial grant is just the tip of the iceberg as ECHO provides planning, obtaining permits and $10,000 in funding towards the improvements for the First Steps Outdoor Learning Environment. Our goal as a school is to also improve the charter outdoor space as we take on this next great step in improving our campus. We are excited to begin this journey! To learn more about ECHO and see transformations of other outdoor spaces click here. We will need the support of Monarch families, local businesses and the communities we serve. Monetary donations are tax-deductible. You can make a donation on December 4th on Colorado Gives Day on either of our pages for First Steps or Charter. Families: Check with your employer to see if your company has a match program as a way of increasing your donation. Click here to make a direct donation. Get your hands dirty and volunteer to help build! Check back here for more opportunities to get involved. Business and Community: We will have opportunities for businesses to get involved! Marketing opportunities as well as donations and volunteering. 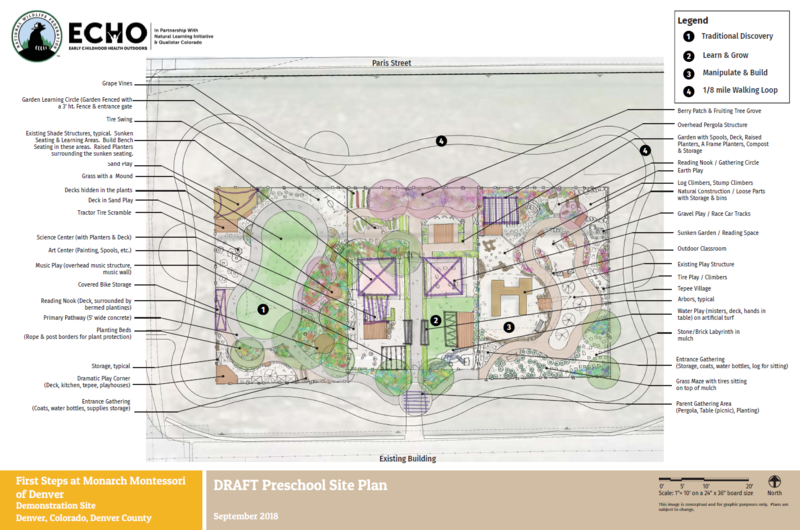 This rendering of the Outdoor Learning Environment for the preschool playground expands the space by 23ft and is then divided into three areas for learning and play. 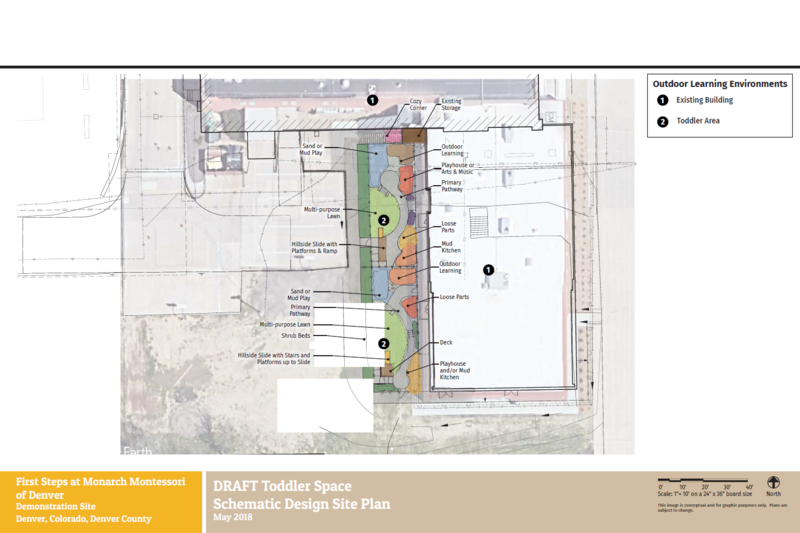 The toddler Outdoor Learning Environment will be relocated just outside of their classrooms (see overall site plan).